Philadelphia and Boston are two cities bursting with tradition. When we think of these two cities, we automatically link them to their successful sports franchises. Philadelphians hearken back to the days of Dr. J, Bobby Clarke and Richie Ashburn among so many other incredible players. Whereas names like Bill Russell, Ted Williams, and Bobby Orr top the list of the many legendary athletes to play in the city of Boston. In the NHL, the Big Bad Bruins of the ‘60s were overrun by the Broad Street Bullies in the ‘70s. In the NBA, Larry Bird and the Celtics clashed with Dr. J and the 76ers in four Eastern Conference Finals between 1980 and 1985. In the NFL, the Patriots defeated the Eagles in 2005. The Eagles won the Super Bowl in 2018 and the city went crazy. Currently, the 76ers and Celtics appear to be returning to their former glory. The Celtics and the 76ers are widely considered to be the top two teams in the Eastern Conference with the departure of LeBron James to the Western Conference. Not far behind are the Flyers and Bruins, both of whom made the playoffs this past season. The Patriots and Eagles remain atop the football world and are favorites to meet again in Super Bowl LIII. The Malcolm Jenkins Foundation started in 2010 to enrich the lives of youth in underrepresented communities. Through various programs, the foundation hosts events that give food, scholarships, and education of life and sport back to the community. The Malcolm Jenkins Foundation operates in four main locations (Columbus, New Orleans, Philadelphia, and New Jersey) that played an important role in Malcolm’s development as a person and football player. The Gronk Nation Youth Foundation encourages children to reach their potential through sport, education, and community. Rob and his four brothers have created a foundation that provides grants to local sports programs that enable youth to participate in athletic programs of their choice. Without this funding, many of the young athletes in the Boston area would not have had the opportunity to engage in organized sport. The Jakub Voracek Foundation came to fruition in April of 2015 as a direct result of the diagnosis of Jake’s sister, Petra, with Multiple Sclerosis. The goal of the foundation is to help collect funds to increase research, support activities, and development of MS centers, as well as support individual patients who have been affected by this disease. Voracek created the Kluk Puk annual charity event to raise funds. The event includes a charity soccer tournament, a raffle and auction, and a chance to take pictures and receive autographs from some of the Czech Republic’s top athletes. Jake also pledged to donate $1,000 for every point he scores during each NHL season. His first two donations totaled $116,000 which would reach just shy of $200,000 based on his 2017/18 statistics. 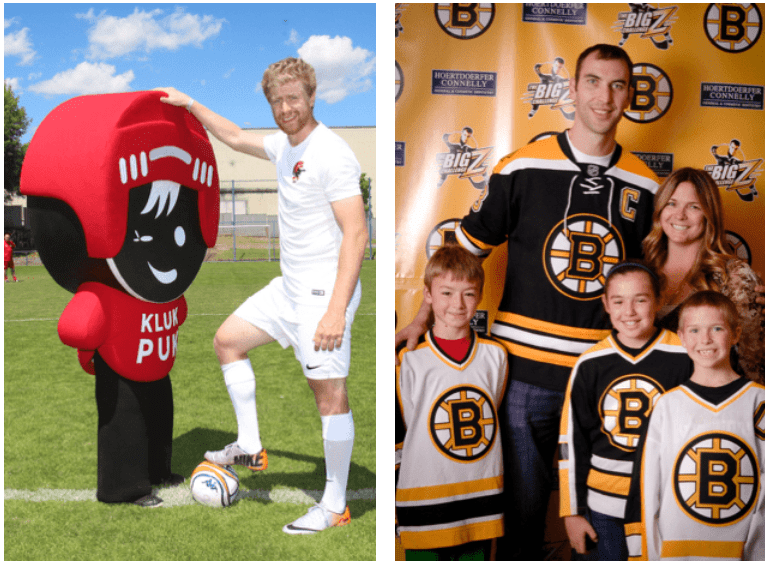 Chara has been involved in the charitable scene in Boston since coming to the city as a free agent in 2006. In 2011, his charitable efforts earned him the Champion Award which is presented by Boston Children’s Hospital. He also created The Big Z Challenge which is an annual charity event, hosted by “Big Z” himself and Dr. Hoertdoerfer. Children can face off against Chara in hockey-related activities to earn prizes including memorabilia, tickets to Bruins games, and other experiences. This annual event has raised funds for pediatric care at the Elliot Hospital and contributed to the Elliot Regional Cancer Center’s expansion plans. New to the Phillies organization for 2018, Carlos Santana wasted no time getting involved in the community. Working as an ambassador for Philadelphia Futures, Santana played host to the “Get in the Game” celebrity bowling tournament. Money raised from this event goes directly toward helping provide higher education opportunities for low-income, first-generation-college students. Santana is no stranger to events like this, having hosted similar bowling events for Boys and Girls Club, Cleveland Children’s Clinic, and Cleveland Police Foundation, among others in his native Dominican Republic. Jackie Bradley Jr. has made tremendous efforts in the community to ensure that youth are receiving every opportunity to succeed. JBJ has served as Captain of the Red Sox Scholars Program, inviting members to meet him, watch batting practice, and enjoy a Friday night home game in Boston. Bradley spoke as a panelist for Thayer Academy’s Diversity Day to impose the wisdom and challenges faced by Jackie Robinson on students from both Thayer Academy and Martin Luther King Jr. School. Jackie Bradley, Jr. has also crafted a “Community Day” dedicated to giving back to his native Prince George County, Virginia. These six athletes exemplify what it means to be part of a strong sports community. They make sure to keep their performances sharp on and off the field. Though they compete as enemies on the field, they work together as allies to keep their communities strong off the field. These athletes are using their platforms to give back and fight alongside one another to combat the challenges in life that really matter. We at Athlete CRUSH applaud efforts like these and are trying to spur positive change by creating a platform which makes charitable efforts highly visible. We want acts like these to prompt actions from other to make a difference as well! Our profile layout makes sure that your charitable efforts do not get drowned out by the clutter of social media. Brand yourself positively and easily using our app! Subscribe to our newsletter to receive news about the launch or contact us at [email protected] if you are interested in being a part of the soft launch!